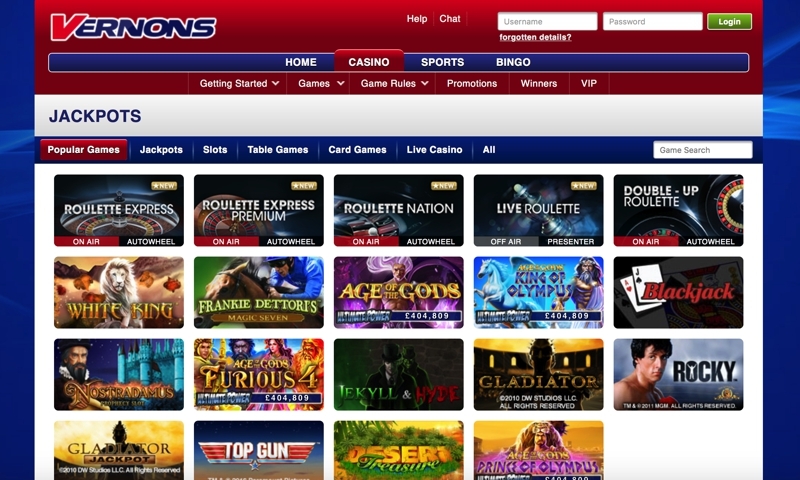 Vernons is a huge, long-established betting giant that has been going since 1925 and now offers almost the full gamut of gambling options. Along with sports betting, they have casino, online bingo, games and poker offerings. Vernons started out way back in 1925 by launching the football pools, a lottery-style game whereby players can win huge prizes (the biggest was over £3m in 2010) by predicting matches that would end as score draws. In 2007 the three biggest pools companies, including Vernons, were brought together under one umbrella, Sportech. Sportech operate in over 30 countries, processing $13bn of bets each year and employing over 1,000 people worldwide. Their headquarters are in London but they operate offices in Liverpool (home to Vernons), Dublin, Atlanta and a number of other cities. This may seem irrelevant but the point is that Vernons are backed by a huge name and have vast resources of both wealth and experience. This means that as a player you know you are dealing with a reputable company, that your money and personal details are secure and that everything will function as promised. Moreover, Vernons, largely through its pools arm has donated over £1bn to good causes, so you can win money and give to charity all at the same time. They are licensed and regulated in Alderney and boast all the usual security and fairness measures one gets with the big boys. Top notch encryption, auditors ensuring fairness and guaranteed privacy all come as standard with Vernons. It may be something of a cliché but can five million players in 150 countries be wrong? Simple answer: no. Vernons offer good customer service 24/7 by live chat, phone and email and given their casino and other interfaces are fast, fun and very easy to use they are an excellent all-rounder and would be a superb addition to your portfolio. 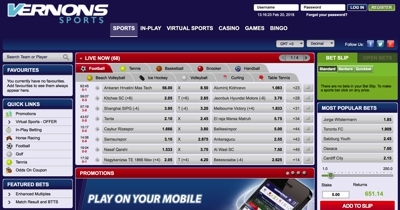 For sports betting Vernons offer a non-nonsense platform. They may not be flush with offers at the moment but they have an easy to use website with a nifty search feature and all the markets you’re likely to be interested in. They’ve also recently been acquired by the Betsson group who are a titan of the Scandinavian betting world – so expect big things to come. 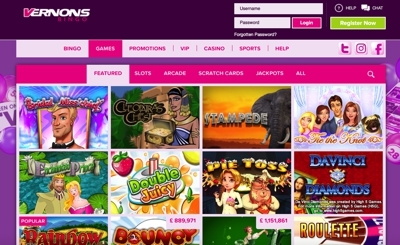 Vernons carry games from the Microgaming network, which is one of the best in the industry. You can play on all of their featured games such The Incredible Hulk, Gladiator, Iron Man 3 and Thor. The integration of live casino games and a plethora of weekly promotions make the site feel fresh and will appeal to returning customers. The platform is available on both a download and flash (browser) based format. Virtue Fusion is the network provider for the bingo hall and it provides users with a solid depth in games to choose from. Games run around the clock and they often have a community feel about them with user interaction within games being very high. The site covers both 75 ball and 90 ball bingo games as well as a number of jackpot rooms. The jackpots can vary, but can often hit five figures, with a weekly game having a huge £1 million jackpot up top. A recent introduction has been the access to mobile games, with an app dedicated to that of their bingo site and increasing plethora of games.